HANDS-ON-BOOKS: Nonfiction for Kids with Fun Activities: Winter (Precipitation) Is Coming! Winter is coming, folks! 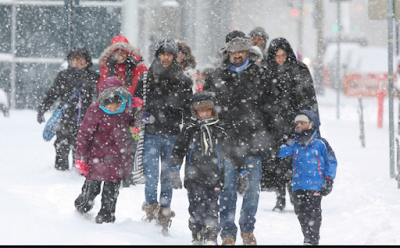 Depending on where you live, it may already feel wintery, but its official start is December 21st at 10:28 am CST. Living on a tilted planet means those of us in the Northern hemisphere are deprived of the Sun's warmth for three months. Earth's top half leans away from the Sun, making its path across our sky short and shallow. Brrrr! Winter storms bring some of the worst weather around—snow, sleet, freezing rain, fierce winds, and plunging temperatures. Confounding the misery of winter storms is the fact that they are difficult to forecast. The heaviest snowfalls often occur when the air temperature is hovering around freezing. If air the snow falls through changes temperature a few degrees one way or the other, it could end up as rain, sleet, or freezing rain (see diagram below). 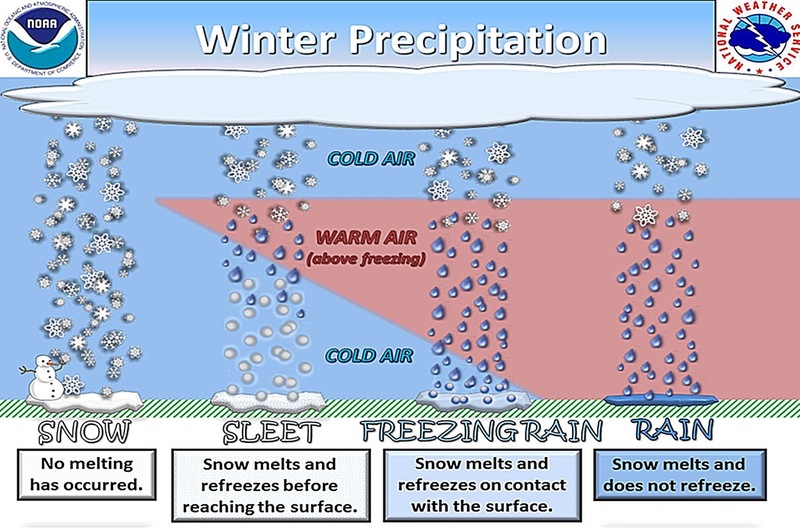 A mixture of different kinds of precipitation is in fact very likely because the storms that bring snow are often caused by warm fronts sliding over cold air near the ground. Here’s a fun and simple activity you can do with students to help them explore winter precipitation. 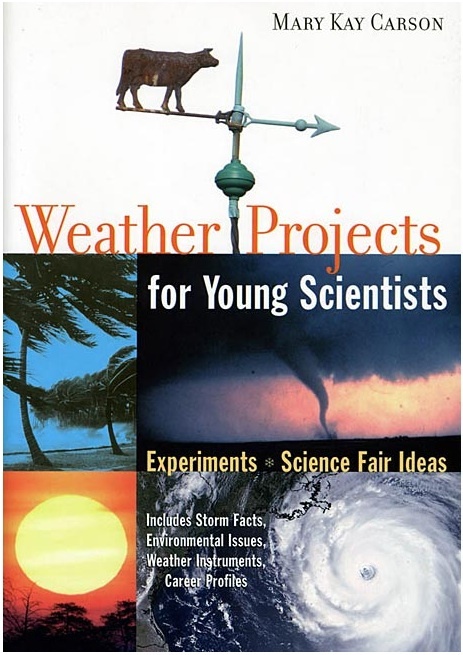 It's from my book, Weather Projects for Young Scientists. Snow and sleet are both frozen precipitation, but they fall very differently from the sky because of their differences in weight and shape. Snowflakes are large crystals of ice that float down slowly because their large flat shape makes for air resistance, like a parachute. Sleet is bits of heavy solid ice that speed towards the ground like tiny rocks. In this activity, you can discover how weight and shape affects the speed of falling. 1. Spread newspaper on the floor and set a chair on it. 2. Mix a 1/2 cup of rice and a 1/2 cup of rice flakes in the cupped hands of your friend. 3. Ask the friend to stand on the chair, carefully holding the cupped cereal and rice. You need to stand back five or so feet from the chair. 4. Have your friend raise her or his hands up high and then let the rice and cereal fall while you watch. Which hit the ground first—the snow-like cereal flakes or sleet-like rice grains? Why?